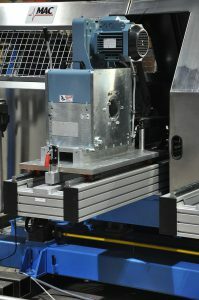 MAC Rotaries use the unique qualities of eddy current rotary probe technology to detect long continuous surface flaws which may not be detected by encircling test coils. Operate with MultiMac® eddy current electronics. Systems with two, four, or six probes, each with its own detector channel. Accurate Distance Compensation ensures a uniform defect signal, even with off center or out of round material. Choose test headplates for surface or air ride configurations, depending on surface conditions, sizes, and test specifications. Dynamic breaking for quick stop of test probe headplate rotation. Rotary probes, unlike encircling test coils, are not affected by throughput speed changes such as occur in parts forming, because the probes spin continually around the test material at a fixed speed. Operates automatically as defects in the bar or wire create flaw signals, activate alarms, paint markers and other devices. Test magnetic and nonmagnetic material from 1/8″ (3mm) to 7.1″ (180mm) diameter. MultiMac® eddy current electronics provide the controls, processing and analysis for the Rotary. 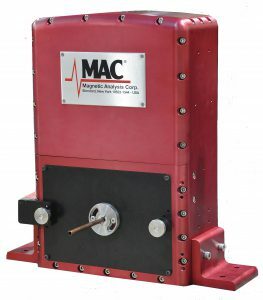 MultiMac® can also assign channels to an encircling coil test to detect short, intermittent defects, in combination with the rotary test, where needed. 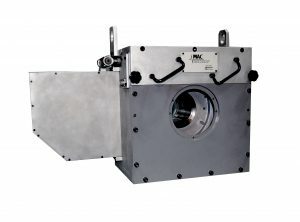 Operation at speeds up to 18,000 RPM for high production output. Highly sensitive non-contact testing with superior results. New and improved, easy to set up Distance Compensation (a critical factor in testing ovate wire). Simple adjustment tools, with convenient dial-in diameter guide. Two spinning test probes that can be adjusted simultaneously for dimensional changes. Probes that can be easily centered on the test product’s center of rotation. Meets all applicable safety requirements. Continuous wire operations such as drawing, spring-making, and parts forming lines. Operates in-line with straighteners, or off-line in a separate test station. Ferromagnetic, non-ferromagnetic, and austenitic materials. Tests round and ovate material. The product is passed through or adjacent to an electrical test coil, which has been excited by an alternating current. This induces a flow of eddy currents around the test material or in the case of a sector coil, in the area under the coil. Short, intermittent anomalies or flaws cause a variation in the eddy current pattern, which the instrument detects.